Every year the Poison Spyder Racing T-shirt commemorates Poison Spyder's presence in off-road motorsports like King Of the Hammers, Ultra4 and desert racing. 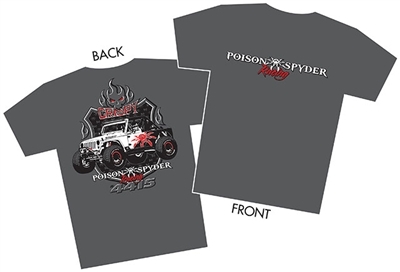 This year's design once again features our Ultra4 racer #4415, AKA "Crispy" on the back, with the Poison Spyder Racing logo on the front. Professionally screen printed on a gray, high quality cotton men's T-shirt.